Simple forms invite the beauty of natural handcrafted wood to stand out, laying the foundation for a warm and welcoming home. 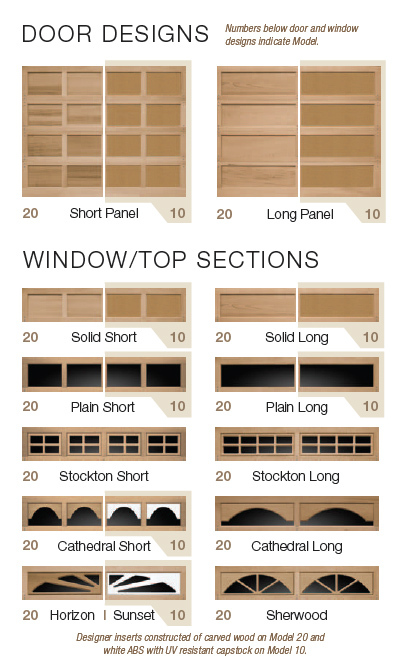 All our wood garage door products. 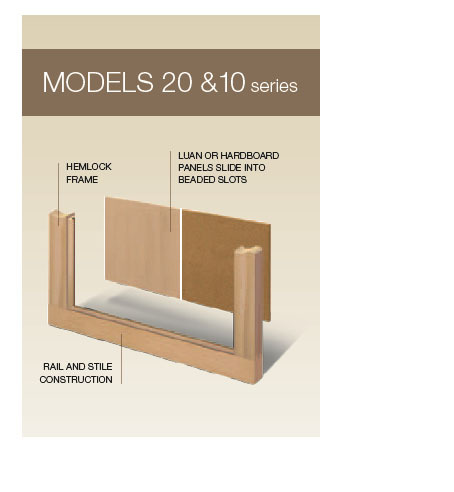 1-3/8" heavy-duty stile and rail and dowel pin construction. Wood species include Redwood, Cedar and Hemlock. 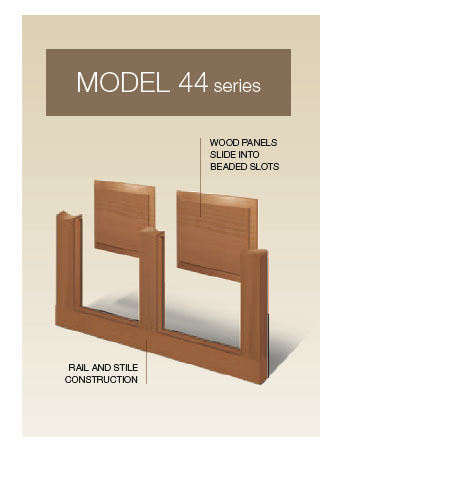 Handcrafted short or long raised panels in Redwood, Cedar, Hemlock (stain grade) or MDF (paint grade). Windows with six handcrafted wood decorative window designs available. 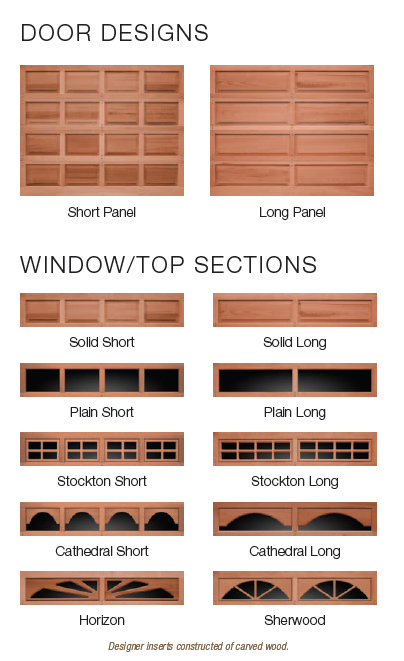 See window design options. Multiple panel and section configurations available. See your Clopay Dealer for details. All doors can be factory primed or finish painted white. Seven factory finished stain options are available on all stain grade wood species, resulting in stain colors that complement most home trim and entry door colors. 1-3/8" stile and rail and dowel pin construction in Hemlock. Flat panels available in Luan, Breckenridge and hardboard. Most available in stain grade or paint grade options. Six optional handcrafted decorative window designs available on Model 20. See windows for availability. Factory priming and white finish paint available. Heavy-duty 1-5/8" (Model 33) or 1-1/4" thick (Model 32A) section thicknesses. Three-layer construction with polystyrene sandwiched between interior and exterior boards. Interior Luan. R-value 5.9. 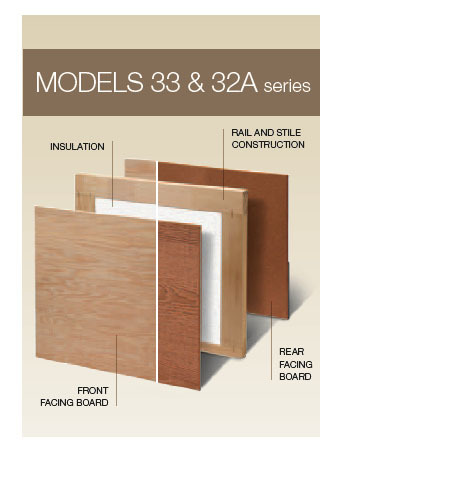 Exterior woods include smooth Luan and Breckenridge Fir on the Model 33 Series and Breckenridge hardboard on the Model 32A. Model 33 available in stain or paint grade options. Factory priming and white finish paint available. Model 32A available factory primed only. Seven factory stained options are available on certain models (check with your local distributor/retailer for details) resulting in stain colors that complement most home trim and entry door colors. Click HERE to see all stain colors available. When you take advantage of Clopay's factory finish paint option,* your wood garage door arrives primed, painted and ready to install. We've eliminated the extra steps of hiring a contractor to finish the door on site and the added worry that the job will be done right. The door is stored and finished according to Clopay warranty guidelines, for a durable, flawless, vibrant finish, worthy of the most discriminating close-ups. Door panels are sealed with a paintable caulk to resist moisture and then treated with a layer of primer followed by two coats of white latex paint. *Not available on redwood or cedar garage doors.